List of Contributors. Foreword. Part I. Introduction. Introduction (P. Bosák et al.). Paleokarst as a problem (J. G&lstrok;azek, P. Bosák, D.C. Ford). Terminology (P. Bosák, D.C. Ford, J. G&lstrok;azek). Part II. Regional Review. Paleokarst of Belgium (Y. Quinif). Paleokarst of Britain (T.D. Ford). Paleokarst of Norway (S.-E. Lauritzen). Paleokarst of Poland (J. G&lstrok;azek). Paleokarst of Czechoslovakia (P. Bosák, I. Horá&ccaron;ek, V. Panoš). Paleokarst of Hungary (G. Bárdossy, L. Kordos). Hydrothermal paleokarst of Hungary (P. Müller). Paleokarst of Italy. Selected examples from Cambrian to Miocene (M. Boni, B. D'Argenio). Paleokarst-related ore deposits of the Maghreb, North Africa (Y. Fuchs, B. Touahri). Paleokarst of Yugoslavia (D. Gavrilovi&cacute;). Paleokarst of Bulgaria (I. Stanev, S. Trashliev). Paleokarst of Romania (M. Bleahu). Paleokarst of the Union of Soviet Socialist Republics (R.A. Tsykin). Paleokarst of China (Zhang Shouyue). Paleokarst of Canada (D.C. Ford). Paleokarst of the United States (M.V. Palmer, A.N. Palmer). Part III. Mineral Deposits Connected With Karst. An introduction to karst-related mineral deposits (P. Bosák). Pb-Zn ores (S. D&zdot;u&lstrok;y&nacute;ski, M. Sass-Gustkiewicz). Bauxites (G. Bárdossy). Iron ore deposits in paleokarst (G. Bárdossy, Y. Fuchs, J. G&lstrok;azek). Clays and sands in paleokarst (P. Bosák). The oceanic karst: modern bauxite and phosphate ore deposits on the high carbonate islands (so-called Uplifted Atolls'') of the Pacific Ocean (F.G. Bourrouilh-le Jan). Paleokarst-related uranium deposits (Y. Fuchs). Part IV. Hydrogeology and Engineering Hazards in Paleokarst Areas. Paleokarst as an important hydrogeological factor (J. Zötl). Hydrogeological problems of opencast and underground mining of mineral deposits encountered during their exploration, development and exploitation stages (P. Bosák). Hydrogeological problems of the Cracow-Silesia Zn-Pb ore deposits (Z. Wilk). Hydrogeological problems of Hungarian bauxite and coal deposits (T. Böcker, B. Vizy). Paleokarst in civil engineering (A. Eraso). Interaction between engineering and environment in the presence of paleokarst: some case histories (J. G&lstrok;azek). Part V. Paleokarst as a Scientific Subject. Special characteristics of paleokarst studies (I. Horá&ccaron;ek, P. Bosák). Tectonic conditions for karst origin and preservation (J. G&lstrok;azek). Problems of the origin and fossilization of karst forms (P. Bosák). Biostratigraphic investigations in paleokarst (I. Horá&ccaron;ek, L. Kordos). Part VI. Conclusions. Part VII. References. Part VIII. Indexes. Author Index. Geographical Index. Subject Index. 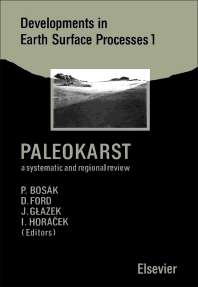 Prepared by some of the world's leading experts in the field, this book is the first summarizing work on the origin, importance and exploitation of paleokarst. It offers an extensive regional survey, mainly concerning the Northern Hemisphere, as well as a thorough analysis of the problems of research into paleokarst phenomena, with particular emphasis on theoretical contributions and practical exploitation. By concentrating on phenomena which have appeared in the course of geological history, the book represents a substantial development in the general theory of paleokarst and demonstrates the advantages of a comprehensive approach to the problem. Considerable emphasis is put on the economic importance of paleokarst phenomena, from the point of view of exploiting significant deposits of mineral raw materials, as well as from a civil engineering and hydrological point of view. Since the publication deals with a boundary scientific discipline, it is intended for specialists from various branches of science: geologists, paleontologists, economic geologists, geographers, mining engineers and hydrogeologists.